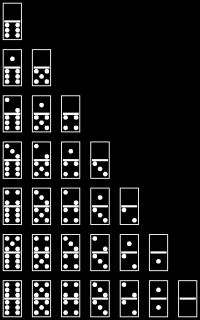 Each domino will measure 18-½” x 9-¼” x 2-½”. 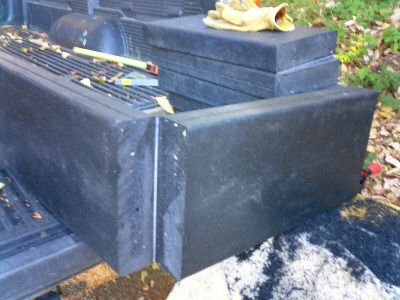 The firms Plastic Lumber Yard and Engineered Plastic Systems can provide 3×10 boards of black, recycled HDPE. These will be cut into proper-size pieces. HDPE is a recyclable material made from, ironically, petroleum. I know that the source that I’ve chosen uses recycled plastic, and I plan to recycle any dominos at the end of the event that otherwise would be discarded. I decided to use 3×10s instead of 3×8s because the resulting dominos will be large enough to stand on, which I expect people will do. Density calculations reveal that each domino will weigh about 12 pounds. The complete set of 28 will weigh about 350 pounds! 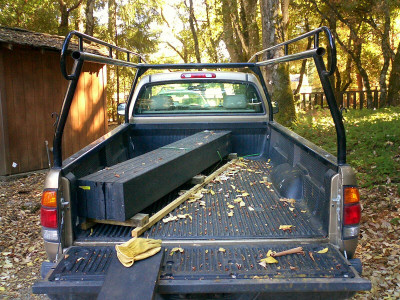 I’m glad that I recently installed air springs on the pickup truck. Fossils. Care for a Trilobite, anyone? Dinosaurs. Perhaps the Sinclair Oil logo? Some oil deposits come from the Paleozoic Era, the Age of Invertebtates, associated with, among other things, trilobites. I found one source that claims that all oil deposits “were formed before the time of the dinosaurs,” while another source claims that most oil is from the Mesozoic Era, the Age of Dinosaurs. I want to resolve this inconsistency. The dominos will be milled on a CNC milling machine using 52‑200B series HDPE router bits from Onsrud Cutter. The CNC milling machine can mill a profile from a bitmap image, but I still need to write a computer program that converts a line drawing into a reasonable profile bitmap. It may be easiest to mill a “negative” image of the fossil. That is, remove the material where the animal or plant used to be. This is because I can use a simple ball-end mill to carve out the negative space. Carving the animal itself will require a much smaller bit, and more milling time. Besides, the sources of this non-renewable resource are extinct. They should be shown in absentia! Likely some of the dominos will go walking during the event. To help reduce such “shrinkage,” I will display a sign that shows all 28 dominos of the complete set. The dominos will be arranged in a triangular pattern that I will use as a chart showing resource depletion vs. time. The X axis will be time; the Y axis will show the quantity remaining of oil deposits. All 28 dominos will be displayed, hinting that they form a set that perhaps should be left together throughout the event. I ordered and received two HDPE “3-by-10″s, one from each manufacturer that I am considering. There are differences in size, finish, and weight. So if I can deal with the shrinkage from the EPS material, it looks like they are the way to go. My current plan is to have the CNC milling machine compensate for non-uniformities anyway. The CNC milling machine can “probe” the workpiece surface, sensing its height. But the probe appears to use a different coordinate system than the cutter. Hmmm…. I need to figure this one out. Probing is necessary for using the nicer looking HDPE material which has non-uniform thickness. While searching for the answer to this problem, I’ve manually milled the edges of a sample from each piece of plastic lumber. 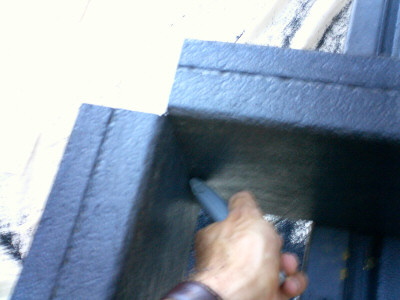 Comparing the results, the choice is clear: the material from EPS is better for this project. It’s not a bug, it’s a feature! A software upgrade solved most of the coordinate-system problem. A second probe arrived (I like having redundancy for critical parts of the project). I’m ready to try probing with the milling machine again, but I’ve been working on the Labyrinth design instead. Surprise! It turns out that one month ago, when I was able to get a sample 3×10 made-to-order, it was before the construction rush. Now that I want more of the same 3×10s, I’m in the midst of the rush. Oops. My first-choice supplier turns out not to make their own lumber. They are a distributor, they’ve changed suppliers, and they are unwilling to place an order with the original supplier whose product I evaluated. Kind of unhelpful, that distributor. Here’s one of my rules: when the advantage of keeping a vendor disolves, you get to re-evaluate your vendor choice. The WWW comes to the rescue! I found a recent magazine article that lists over 30 plastic-lumber companies in the United States and Canada. Several telephone calls later, and I think I’ve found the supplier who provided the original material. So essentially, the distributor’s unhelpful behavior led me to discover that I can bypass him! Bye, bye EPS! Hello, Bedford Technology! Fate works in unexpected ways. The order for the plastic lumber has been placed. There’s a bit of a lead time. I should have 3 or 4 weeks to do the machining before Burning Man. Until then, I have another piece to practice on. The manufacturer has some glass-fiber reinforced HDPE in stock, but I’m going to pass on it. The glass fibers might get into people’s fingers, and it’s really hard on the end mills and router bits that I use. Even though there’s a wait, this seems like the best approach. 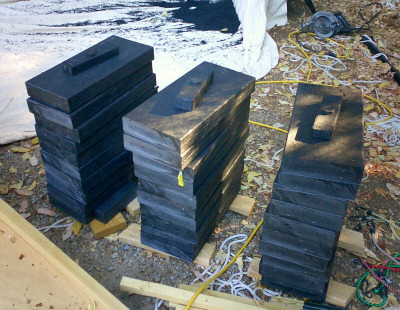 Over four hundred pounds of recycled high-density polyethylene arrived. The final length of each domino will be 18.5 inches. 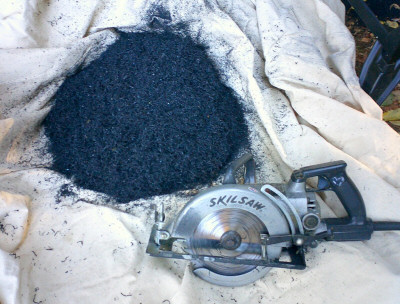 To allow for machining, I cut each domino blank 19 inches long, using a thin carbide-tipped blade in my Skilsaw. The worst thing that can happen is melting instead of cutting, but the blade was sharp. The result was lots of plastic sawdust. 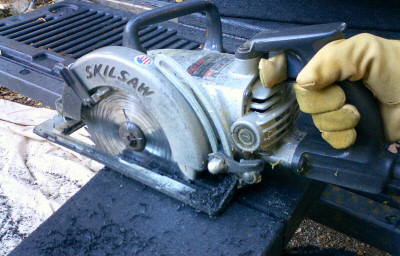 The Skilsaw can cut a 2-1/4-inch kerf depth, but each board of the plastic is 2-3/8 inches thick, so a 1/8-inch strip is left at the bottom of the cut. Practical application of a utility-knife blade, and the domino blank is released. 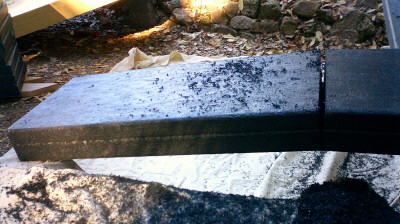 In less than 90 minutes, 400 pounds of recycled plastic is cut into 30 domino blanks . . .
. . . and a big pile of saw “dust”.